Ryan Moore brought this week's tally of winners to nine on Aloft in the closing Queen's Vase, a modern-day Royal Ascot record. The previous post-war record of eight was held jointly by Lester Piggott (1965 and 1975) and Pat Eddery (1989). "Ryan Moore is a brilliant jockey, anyone can see that," said Piggott. "To win nine races during any week is a fantastic achievement, but to do it at Royal Ascot where the competition is so tough is extremely impressive. I'm sure Ryan will go on to break many more records during his career." A P McCoy, the record-breaking 20-time champion jump jockey who took part in today's Royal Procession and is now retired, said: "I did think this morning that Lester Piggott's nine Derby winners and 116 Royal Ascot winners takes some doing. But at his age, Ryan Moore is the best jockey in the world. That is not me saying that, statistics will tell you that Ryan Moore is the best jockey in the world and he is getting better. He makes very few mistakes and I am very jealous of him." After dismounting from the Aidan O'Brien-trained Aloft, Moore was in haste to leave for rides at Newmarket's evening meeting. "Nine winners is not something you think about," he said. "I've a few rides tomorrow and I'll think about it then. "Aloft is a horse with plenty of ability and it was his first run of the year. I am delighted with his performance and he will improve - hopefully he has got a good future." Moore has been O'Brien's first-choice rider this season and the trainer has supplied five of the jockey's victories this week. "I'm delighted for him," he said. "He's a great rider and a great fella and it's great to have him on board." Aloft, the 5/2 favourite, came through late in the two-mile race to beat Tommy Docc and Future Empire two half-lengths. It was the Galileo colt's first run since his second place in last season's Racing Post Trophy and a return to Doncaster for the St Leger will be an option open to him. 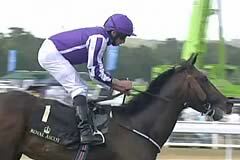 "He's had a few little niggles that have kept him off the track," said O'Brien. "He's a very nice horse and Ryan rode him perfectly at his first try at more than a mile."